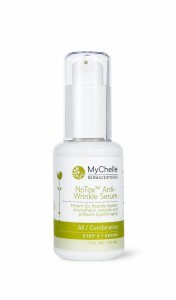 If you’re a fan of Botox but hate the high price, check out MyChelle’s NoTox Anti-Wrinkle Serum. First of all, this first-class formulation smells decadently delicious, thanks to such ingredients as geranium oil, coconut and honeysuckle. It’s also loaded with five peptides that support collagen and elastin production. Unlike other serums that coat your skin or feel greasy, NoTox slides on and seeps into your pores instantly, and you’ll love the results. In fact, you’ll love all of MyChelle’s products – they are a frontrunner in bioactive beauty, offering potent, nontoxic skincare that blends dermaceutical-grade ingredients with modern technology, to offer superb results. And the price for NoTox? A mere $54.99 for one ounce, which is a fraction of the price of your Botox visit at the plastic surgeon’s office. Other winning formulations in MyChelle’s line include a Creamy Pumpkin Cleanser ($9.69 for 2.1 oz.) that is loaded with honey, clove leaf oil, and blue-green algae, and also smells like one singular sensation. Also in this classy cornucopia is MyChelle’s Fruit Enzyme Mist ($27.59 for 4.4 oz), which blends antioxidant turmeric with the Vitamin-C rich superfruit mangosteen, red grapefruit peel and pineapple. Together, these formulas will pack a one-two punch to your complexion – and don’t you want to be a knockout? Make sure to pack these affordable complexion powerhouses into your suitcase when you’re on the go, anywhere from Boston to Bora Bora.For more super skincare tips, check out my new bestselling book, THE GLOBETROTTER’S GET-GORGEOUS GUIDE: Diet and Beauty Secrets of Travel and Beauty Pros, Traveling Executives and Celebrity Travelers!